Room 237 is an amusing and surprisingly layered deconstruction of Stanley Kubrick’s The Shining. Perhaps some may view the film as inconsequential, but much of the analysis, whether the film is a metaphor for American colonialism and the slaughter of Native Americans or an elaborate side project for Kubrick to confess his involvement in a fake moon landing, there’s intriguing evidence provided. 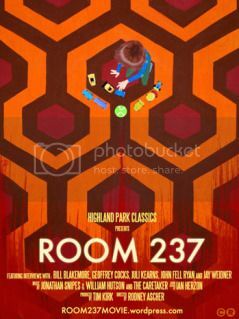 And that is what makes Room 237 so remarkably compelling – it posits various conflicting theories as a means of questioning the nature of film criticism and how one’s life experiences and worldview shape their means of interpretation. Utilizing footage from The Shining, Making “The Shining”, and other Kubrick films (most hilariously, Eyes Wide Shut), Ascher amasses multiple perspectives from people who have their own crackpot interpretation of The Shining. The audience never sees the individuals; rather Ascher simply utilizes their voiceover over various bits of the film. Some worldviews may intertwine, particularly in some of the more sober perspectives, which include Indian burial ground and the Holocaust. Despite not placing a face on the voice, Ascher does a commendable job of intermingling various viewpoints into a richly dense piece on a singular picture. Perhaps most impressive is an account of the architecture of the Overlook Hotel, which includes the placement of the “impossible window”, whereupon the structure of the hotel (particularly when using the various tracking shots of Danny on his tricycle) defies logic. While valuable for its perspectives, the film’s central thesis is one based on the idea of how one’s experiences shape their intake of a film, affording people the opportunity to shape their interpretation of events. The rich detail of every frame in The Shining provides audiences with the opportunity to latch onto one specific item in the backdrop. Whether it be a can tin or a poster, something is to be said about those who can capture that split-second visage and allow their imaginations to run amok. Room 237 is a picture that dangerously buckles the line of novelty and substantive filmmaking. While providing plenty of interesting tidbits and compelling interpretations, Ascher almost gets lost in the hedge maze of angles and doesn’t structure the picture effectively to unite his various ideas. The formlessness of the picture, aside from a few title cards that denote the entry of a new idea, problematizes some of the picture’s already garbled mess of perspectives. But as a great admirer of Kubrick’s output and The Shining, it is hard not to get swept up with the obsessive adoration that Room 237 promotes.